It’s been about six years since I finished the previous book in Scott Lynch’s series and given how much I enjoyed the previous books I approached the third book with a mix of anticipation and nervousness that it wouldn’t live up to its predecessors, not helped by some fairly mixed reviews suggesting that many people were a bit disappointed in it. Overall I enjoyed reading and liked many of the things that happened in it but there were some things that I think didn't work and some things I'm still not quite sure how I feel about them. The story alternates between a ‘present-day’ story as Locke and Jean are coerced into helping rig an election and flashbacks set before the beginning of the first novel showing some of their early adventures in Camorr, the two being linked by the character of Sabetha who was often mentioned in earlier books but hadn’t appeared in person until this book. The main purpose of the flashbacks is to show how Locke first met Sabetha and how over the years they developed into friends, rivals and ultimately lovers, while in the present day Locke is reunited with her after a long estrangement but finds that she is working for his opponents in the election. I think the flashback part of the story worked well. I’ve seen some complaint in other reviews that not enough happened in it to justify the number of pages spent on it, and they may have a point but I enjoyed seeing the full complement of the Gentleman Bastards working together and it was a good introduction to Sabetha – I don’t think the present-day part of the story would have worked if we hadn’t seen some of Sabetha and Locke’s past relationship. There might sometimes be a lack of tension since we know that the characters are never in any real peril and will survive even when they’re in a very dangerous situation, but there’s still plenty of interest in seeing how they avoid getting killed or arrested. Before reading the book I was a bit nervous that Sabetha might turn out to be a disappointment when she finally appeared after being repeatedly mentioned during the previous two books, but I think Lynch did a good job of making her the equal of Locke and Jean even if it might have been nice to see more of the story from her point-of-view. I wasn't too keen on the "romance" between Locke and her, while Locke's behaviour in the flashbacks may have been typical teenaged foolishness it's a bit irritating (although admittedly not implausible) when he was still behaving the same way towards her in the 'present day' part of the story. Having a potential romance as one of the central parts of a book can be a problem when it often seems that they would be better off apart, I'm not sure that I really wanted to see them ending up together. In the book's defence I think the awkwardness of this romance was part of the point of the story, and Locke does at least seem to be showing a bit more maturity regarding the relationship towards the end of the book. I thought the first part of the present day story in Lashain was a bit dull. We're told repeatedly that Locke is fatally ill after the events of the previous book and on the verge of dying but since it seems unlikely that he will die there's little tension here, although at least it does provide a good explanation for why he ends up working for the Bondsmagi. The story picks up a bit when it gets to Karthain and Sabetha’s welcome for them amusing. I thought this part of the book did a decent job of portraying the Bondsmagi and explaining why they're not dominating the world in the way they should be able to given their power. We don’t see much of most of the Bondsmagi but Patience is one of the best characters in the book, managing to remain enigmatic throughout and switching effortlessly between being helpful and threatening. However, I thought that plotline started to develop some flaws in the second half of the book. Locke and Jean's attempts to win the election don't seem as well described as some of their earlier heists, and some parts of the eventual outcome are explained it’s still unclear how the result unfolds. There's also a bit of a problem spending so much time on a contest where nobody really cares about the outcome and Locke and Jean don’t have a significant stake in them winning or losing, it’s not particularly compelling. I think the most contentious part of the book and the bit which I’m most unsure about how I feel about it is some unexpected revelations we are given about Locke’s background. There were some hints going back to the first book that there mysteries in his past, but the answers given here are unexpected and the lack of apparent foreshadowing in previous books makes the revelations seem a bit abrupt. There is also a lot of ambiguity here, most of the information comes from Patience and although it seems some of it is true it’s not clear whether she’s really telling the whole truth and she herself suggests that she might be deceiving Locke. It’s also unclear what all the implications of these revelations are, perhaps if future books reveal more information I will be a bit more confident how I feel about it. The story also seems to be expanding and involving events that might shape the entire world, which in some ways feel like a bit of a departure from the previous books since it was part of the charm of “The Lies of Locke Lamora” that it was a fantasy book that wasn’t about trying to save the world. 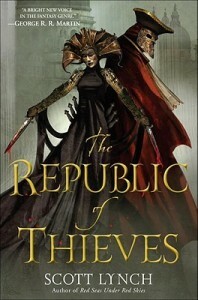 In summary, while I think The Lies of Locke Lamora is one of the best fantasy novels of the past decade I don’t think either of the sequels has managed to live up to it and while there are plenty of good bits in Republic of Thieves I think there are also an unfortunate number of flaws.